Olive Juice is continuing its fabulous $10, $15 and $20 sale until Sunday. There are countless fantastic pieces still left, and you can sort by size to make quick work of bargain hunting. Above are two of my favorites from this sale. The great "vineyard grape" knit short sleeve Denise dress on the left is just $10 and would be perfect to ease into fall (imagine it with orange tights!). 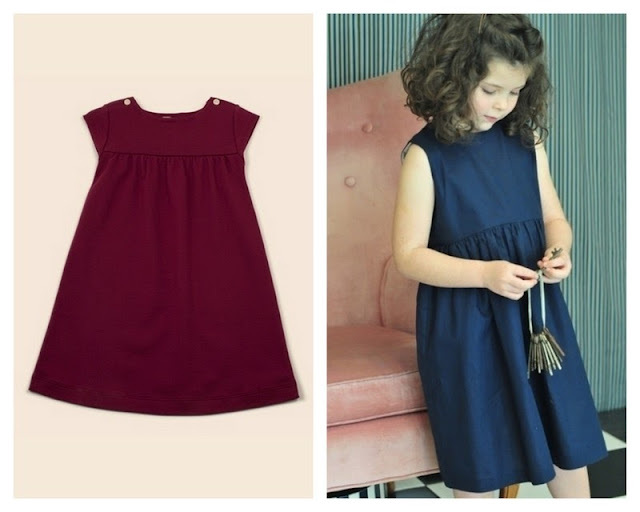 The navy linen picnic dress on the right (available in size 4 and 5) is also just $10 and is made from the most comfortable mid-weight lined linen you can imagine. It's the perfect dress to go from casual summer days to dressy occasions. And, to make this sale even better, you can eliminate the shipping cost with the coupon code below. I promise that there is something for everyone in this sale, from boys' polos and button-downs to twirly skirts and knit tops. Olive Juice will always impress you with its craftsmanship and quality. sweet. I just picked up a few things for my girlie. thanks! So glad! Enjoy the rest of the weekend. This is totally my new favorite blog!! Love the great deals you posted on quality kids clothes!!! Welcome and thanks for leaving a note! Thank you for sharing the deals you find. We picked up a couple of dresses for our girls when you first posted about their sale. They loved them so much, we turned around and bought more. Your great taste and efforts to share these deals is appreciated!